For the Lambda Iota Chapter, recruitment (or rush) is a very exciting time. It determines the future of our Chapter, and the brothers love to be involved. Lambda Iota holds one set of rush events at the beginning of each fall semester. However, the process is more than just a few weeks of events, discussions and invitations. After a new pledge class is formed, recruitment for the subsequent fall begins for current members. 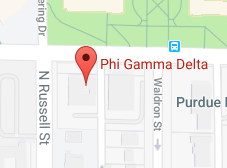 Often without realizing, simply embodying our values and wearing our letters promotes Phi Gam recruitment on campus year-round. Recommendations through word of mouth and recruitment applications allow us to begin thinking about potential new members throughout the year. We have found this effective because brothers living in-house are in the best position to advocate those who would enhance the current state of the Chapter. Additionally, Lambda Iota graduates play an integral role in the recruitment process. We encourage their input and they love sharing their high praise of men they believe would be great additions to the Chapter. They appreciate the simplicity with which they can vouch for family members, friends and further support the recommendations of their pledge brothers via email, letters and the applications. With that being said, we value the effort put forth by rushees above all else. Many men who aren’t recommended or don’t know anyone in the Chapter before rushing end up receiving invitations. This is because of their interest in the brothers and their desire to be a Fiji. No matter how many recommendations someone may get, he will never receive an invitation without making efforts to meet the brothers at our rush events. We build pledge classes of men with diverse backgrounds who come to Purdue from all over the globe. Please contact our Rush Chairman, Clay Steele, with any questions regarding the Fraternity of Phi Gamma Delta, the Lambda Iota recruitment process or Greek Life in general. He can be reached at rush@purduefiji.com or 614-270-9286. We don’t ask that you bring anything but yourself. Dinner will be provided for each event. House tours will be given and sports will be played outside. We’re looking forward to another great year!